The people of Hi`ilani consider themselves fortunate to be stewards of a land that has great potential and wisdom. The Idea Laboratory is the culmination of the many innovative minds that have come to this land with the goal of creating a house that will reflect the most advanced thinking for years to come. It was built with the idea of giving back, of being a base for education, and for new thought to bring renewal of spirit by living in ways that are kind to the Earth. This is an ecologically based approach seeking to be self sufficient, energy independent, and agriculturally conscious. Hi`ilani is built on some of the most exciting technologies and expansive new thinking available. Strategic collaborations have also opened opportunities to bring in manufacturers who have new technologies which are in test stages of development. We welcome opportunities to be a demonstration site for technologies and products of the future. This land and building will serve as a beacon for carbon-neutral design. The project introduces ways of building that will help ensure abundant resources for generations that will follow us, rather than leaving them with an environmental debt to repay. 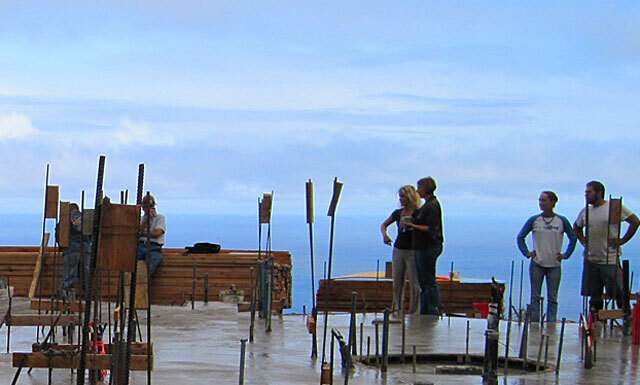 Hi`ilani has hosted many educational workshops and events, from orientations for visiting eighth graders from the Waldorf School in Ashland, Oregon and architecture students from the University of Hawaii, to symposiums demonstrating new product technologies to professionals in the building field.